We are conducting this study to see the effects of Vitamin C, Hydrocortisone and Thiamine administered together on organ injury in people with severe infections. We want to determine if these drugs administered together will be helpful for people with severe infections. Vitamin C and Vitamin B1 (also called Thiamine) are vitamins which are essential for the function of the cells in your body. Without adequate Vitamin C and Thiamine, certain aspects of energy production would not take place properly. Hydrocortisone is a corticosteroid (a naturally occurring compound in your body) that is commonly used for the treatment of patients with low blood pressure caused by severe infections. Recent studies have shown that patients with serious infections often have low levels of Thiamine and Vitamin C in their body. In addition, there is some evidence that giving Thiamine to patients with septic shock improves energy production and may prevent organ injury, even in those who are not deficient. Furthermore there is recent data suggesting that the combination of Vitamin C, Hydrocortisone, and Thiamine may be beneficial in patients with severe infection. The Open Philanthropy Project’s mission is to give as effectively as possible and to share its findings openly so that anyone can build on it’s work. It identifies outstanding giving opportunities, makes grants, follows the results and publishes its findings for the greater good. Through research and grantmaking, they hope to learn how to make philanthropy go especially far in terms of improving lives. We appreciate their support in helping us try to improve survival in patients with severe infections. 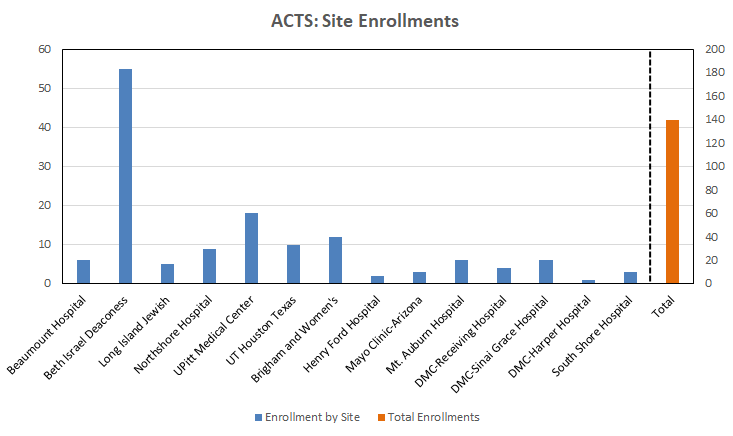 BIDMC and the ACTS study is led by principal investigator Michael Donnino, MD. Beaumont is led by site principal investigator Ronny Otero, MD and clinical research coordinator Laura Stuecher, RN. BWH is led by site principal investigator Peter Hou, MD and clinical research coordinator Lauren Precopio. Henry Ford is led by site principal investigator Junior Uduman, MD and clinical research coordinator Jacqueline Day, RN. LIJ is led by site principal investigator Lance Becker, MD and clinical research coordinators Martina Brave and Timmy Li, PhD. LIQ is led by site principal investigator Lance Becker, MD and clinical research coordinators Martina Brave and Timmy Li, PhD. Mayo is led by site principal investigator Ayan Sen, MD and clinical research coordinator Sarah Kirkland, RN. Mount Auburn Hospital is led by site principal investigator Jessica McCannon, MD. South Shore is led by site principal investigator Mark Hershey, MD and clinical research coordinator Maureen DeMenna, RN. UPitt is led by site principal investigator David Huang, MD and clinical research coordinator Denise Scholl. UT is led by site principal investigator Pratik Doshi, MD and clinical research coordinator Misty Ottman, RN. Detroit Receiving is led by principal investigator Robert Sherwin, MD and clinical research coordinator Thomas Mazzoca, RN.